Neither Mark nor Gavin will accept one’s quicker, but score is expected to be settled. 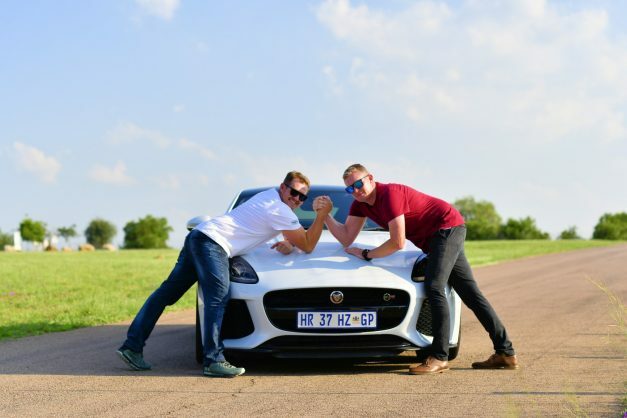 A decades-long rivalry between two world champion racing drivers will finally be settled when brothers Mark and Gavin Cronje square up at the Jaguar Simola Hillclimb. The duo will compete in ferocious and identical Jaguar F-Type SVR Coupes – with a total of 846 kW and 1400 Nm – and by the end of the event, which runs from May 2 to 5, race fans will have an answer to the big question – who is quicker: No 24 or No 25? The brothers are well equipped to take on the 1.9km hill at the Simola Golf Resort in Knysna, the Western Cape, with a wealth of racing experience across a wide variety of formulas between them. The rivalry began around the age of 10 for the Cronjes, when Mark (#24) and Gavin (#25) discovered they were fighting for podium positions and race wins in karts, not only against other competitors but with each other. Neither Mark nor Gavin will accept that their sibling is quicker, but the score is set to be settled once and for all. Jaguar’s performance flagship sports car has secured numerous podium spots at South Africa’s premier racing event over the years and has all the ingredients needed to tackle the hill. With a V8 supercharged engine driving all-four-wheels through an eightspeed automatic transmission, the F-Type SVR is said to scorch from 0-100km/h in 3.7 seconds and on to a top speed of 322 km/h. First held in 2009, the Jaguar Simola Hillclimb celebrates its 10th anniversary this May. As always, the racing will kick off on May 2 with the yearly Classic Car Friday competition, followed by King of the Hill practice and qualifying sessions on the Saturday, two more qualifying runs on Sunday morning and the coveted King of the Hill Finale on Sunday afternoon. Race fans who cannot be present in Knysna will have the choice of watching on two live stream platforms. Viewers can go to Jaguar South Africa’s Facebook page at facebook.com/JaguarSA during the event to watch practice, qualifying and class final runs as they happen. Jaguar South Africa’s YouTube channel at youtube.com/user/JaguarSA1 will also stream nonstop from Friday morning to Sunday evening with a continuous loop of on-track action when no live racing is taking place. Follow the 2019 Jaguar Simola Hillclimb action on social media before, during and after the event using the #JaguarSHC hashtag.